It was Woz who said it first, and a (now removed) Best Buy screenshot reiterates it - the much talked-about white iPhone 4 is coming soon. 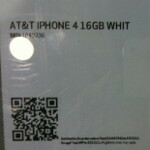 The AT&T version of the iPhone 4 is soon to be available in white, and it will have the same price as its black brother - $599 without a contract for the 16GB model. The second picture below shows that the Canadian retailer The Source is also set to offer this version of the handset, so it's only a matter of time, with previous rumours pointing at February 27 as the release date of the white iPhone 4. I'm curious as to why they didn't offer it in white first to match its computers, and then offer black later. Must have been for future marketing purposes, since the demand for black may not have been as much.